The ∇•B = 0 equation is true, always, unlike the ∇×E = 0 expression, which is true for electrostatics only (no moving charges). Note that we have no ‘time component’ because we assume the fields are static, so they do not change with time. Now, because that’s a relatively simple situation, you may wonder whether we really simplified anything with this vector potential. 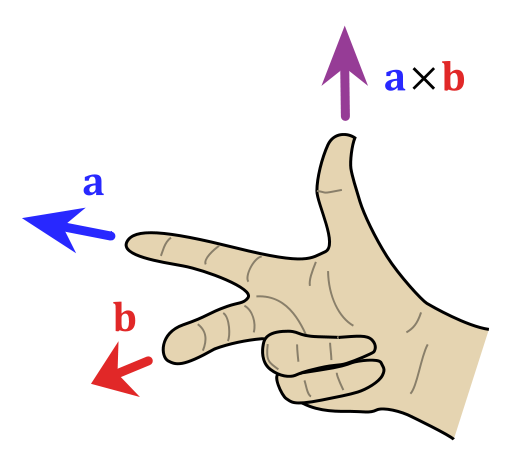 B is a vector with three components, and so is A. The answer to that question is somewhat subtle, and similar to what we did for electrostatics: it’s mathematically convenient to use A, and then calculate the derivatives above to find B. So the number of components doesn’t matter really: it’s just more convenient to first get A using our data on the currents j, and then we get B from A. First, we need to put some constraints on A, because the B = ∇×A equation does not fully define A. It’s like the scalar potential Φ: any Φ’ = Φ + C was as good a choice as Φ (with C any constant), so we needed a reference point Φ = 0, which we usually took at infinity. With the vector potential A, we have even more latitude: we can not only add a constant but any field which is the gradient of some scalar field, so any A’ = A + ∇Ψ will do. Why? Just write it all out: ∇×(A + ∇Ψ) = ∇×A + ∇×(∇Ψ). But the curl of the gradient of a scalar field (or a scalar function) is always zero (you can check my post on vector calculus on this), so ∇×(∇Ψ) = 0 and so ∇×(A + ∇Ψ) = ∇×A + ∇×(∇Ψ) = ∇×A + 0 = ∇×A = B. First, you should note that, in my post on gauges, I mentioned that the choice is different when the time derivatives of E and B are not equal to zero, so when we’re talking changing currents and charge distributions, so that’s dynamics. However, that’s not a concern here. To be fully complete, I should note that the ‘definition’ above does still not uniquely determine A. For a unique specification, we also need some reference point, or say how the field behaves on some boundary, or at large distances. It is usually convenient to choose a field which goes to zero at large distances, just like our electric potential. Phew! We’ve said so many things about A now, but nothing that has any relevance to how we’d calculate A. 😦 So we are we heading here? Finally, and just in case you wonder what is what, there’s the illustration below (taken from Feynman’s Lecture on this topic here) that, hopefully, will help you to make sense of it all. with n the number of turns per unit length of the solenoid, and I the current going through it. However, in the mentioned post, we assumed that the magnetic field outside of the solenoid was zero, for all practical purposes, but it is not. It is very weak but not zero, as shown below. In fact, it’s fairly strong at very short distances from the solenoid! Calculating the vector potential allows us to calculate its exact value, everywhere. So let’s go for it. The relevant quantities are shown in the illustration below. So we’ve got a very long solenoid here once again, with n turns of wire per unit length and, therefore, a circumferential current on the surface of n·I per unit length (the slight pitch of the winding is being neglected). So how do we do this? As should be clear from the whole development above, the principle is that the x-component of the vector potential arising from a current density j is the same as the electric potential Φ that would be produced by a charge density ρ equal to jx divided by c2, and similarly for the y- and z-components. Huh? Yes. Just read it a couple of times and think about it: we should imagine some cylinder with a surface charge ρ = –(J/c2)·sinϕ to calculate Ax. And then we equate ρ with –(J/c2)·cosϕ and zero respectively to find Ay and Az. The illustration below shows the quantities involved. Note that we’re talking a uniform magnetic field here, along the z-axis, which has the same direction as B0 and, hence, is pointing towards you as you look at the illustration, which is why you don’t see the B0 field lines and/or the z-axis: they’re perpendicular to your computer screen, so to speak. You should compare this formula with the formula for A outside the solenoid, so you can draw the right conclusions. Note that both formulas incorporate the same (1/2)·n·I/ε0c2 factor. The difference, really, is that inside the solenoid, A is proportional to r’ (as shown in the illustration: if r’ doubles, triples etcetera, then A will double, triple etcetera too) while, outside of the solenoid, A is inversely proportional to r’. In addition, outside the solenoid, we have the a2 factor, which doesn’t matter inside. Indeed, the radius of the solenoid (i.e. a) changes the flux, which is the product of B and the cross-section area π·a2, but not B itself. Let’s do a quick check to see if the formula makes sense. We do not want A to be larger outside of the solenoid than inside, obviously, so the a2/r’ factor should be smaller than r’ for r’ > a. Now, a2/r’ < r’ if a2 < r’2, and because a an r’ are both positive real numbers, that’s the case if r’ > a indeed. So we’ve got something that resembles the electric field inside and outside of a uniformly charged sphere, except that A decreases as 1/r’ rather than as 1/r’2, as shown below. A (uniform) magnetic field B in the z-direction corresponds to a vector potential A that rotates about the z-axis with magnitude A = B0·r’/2 (with r’ the displacement from the z-axis, not from the origin—obviously!). So that gives you the A inside of a solenoid. 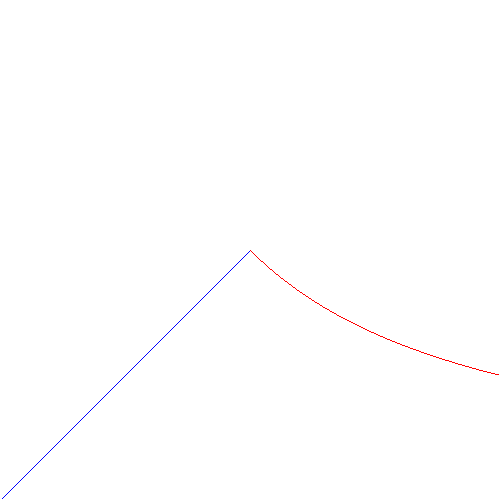 The magnitude is A = (1/2)·n·I·r’/ε0c2, so A is proportional with r’. Outside of the solenoid, A‘s magnitude (i.e. A) is inversely proportional to the distance r’, and it’s given by the formula: A = (1/2)·n·I·a2/ε0c2·r’. That’s, of course, consistent with the magnetic field diminishing with distance there. But remember: contrary to what you’ve been taught or what you often read, it is not zero. It’s only near zero if r’ >> a.